No one would ever understand this thingy . Can someone please in easy and understandable language explain me the parts of which Autocheck system consists? In other words - If I were to remove a complete Autocheck system(except for the instrument cluster) from another car and to install it to mine , what would I have to take out? If someone could take some time out of their life and help me with this , I would be very greatful! Ignas.quattro hat geschrieben: If someone could take some time out of their life and help me with this , I would be very greatful! It's been a few years since I did the operation last, and this is from memory only, so no guarantees! 2) The relay socket for relay 281 including the wires which go directly to the fuse-box. 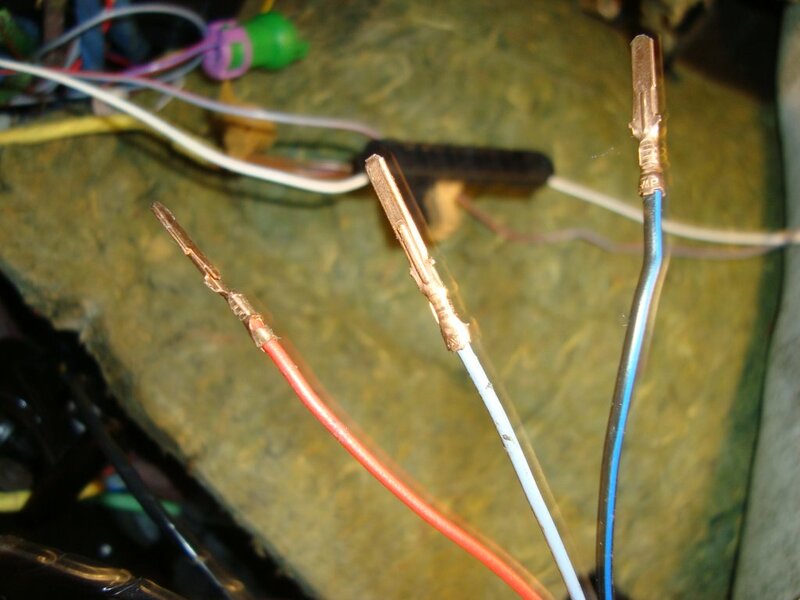 All of the other wires are more or less single wires, which can be quite easily "replicated". Wow , this is the most help I've got so far!!! This is roughly what I imagined - easy to understand and with pictures ) Now I start to see things much clearer!!!! Ignas.quattro hat geschrieben: Wow , this is the most help I've got so far!!! This is roughly what I imagined - easy to understand and with pictures ) Now I start to see things much clearer!!!! Oh snap, the guy is completely getting rid of the remaining body during the weekend and I'm going there on thursday , hopefully... it's rather far away from me, ~70kms one way. Ignas.quattro hat geschrieben: Oh snap, the guy is completely getting rid of the remaining body during the weekend and I'm going there on thursday , hopefully... it's rather far away from me, ~70kms one way. Again, this is only from memory and my old pictures - I havent had time to double-check anything, so no guarantees ! The grey/white wire goes directly to the 1,8bar oil pressure switch via the engine wiring harness – I didn't want to remove the whole engine wiring harness, so I cut that wire. 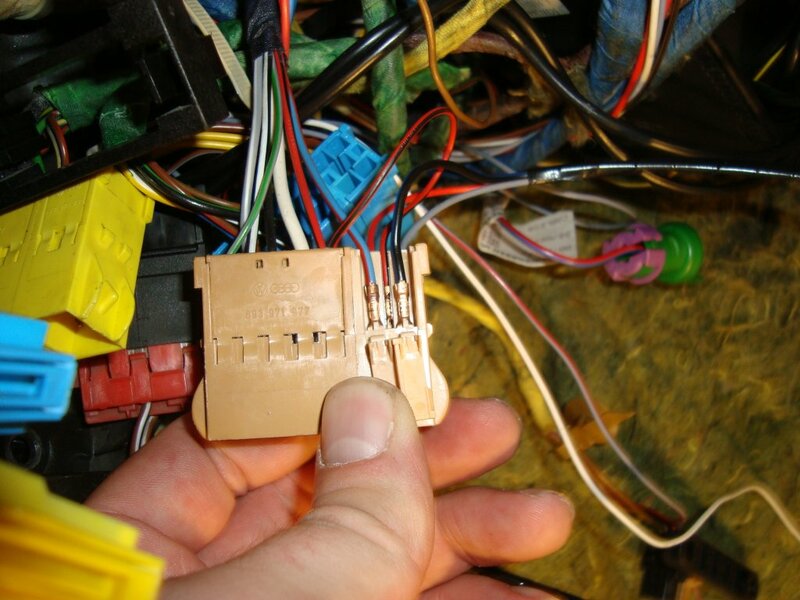 The yellow/green and yellow/brown wires connect to the green plug in the bottom of the fuse box, and can be removed from that without cutting. The brown wire (ground) will need to be cut, unless you take the whole harness. The white wire (in the yellow plug) goes to the windshield washer fluid sender, and will have to be cut (unless you untangle the whole engine wiring harness). The grey/red wire in the yellow plug goes to the hydraulic brake pressure switch, and will have to be cut (unless you untangle the whole engine wiring harness). Again, you can of course take the whole wiring harness, or you can cut somewhere on the strand which goes towards the front of the car. 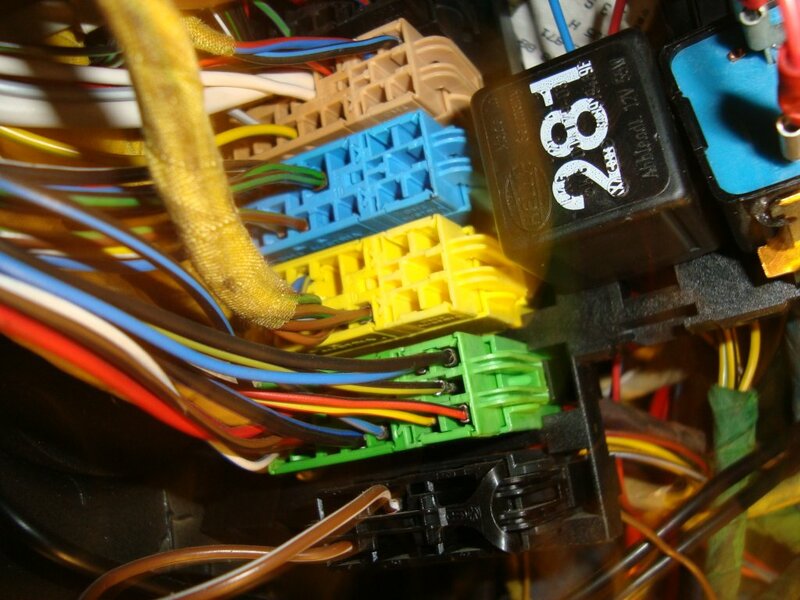 In that strand, there are 3 thin wires which will not be found in the non-autocheck wiring harness, those are the red, the gray and the black/blue wire (red and grey can be seen coiled together in the bottom left of the picture) those can be followed to a plug in the front of the car if you don't want to cut them, but if I remember correctly, they are quite entangled in the rest of the wiring harness (I did untangle them though, but I wasn't under time-pressure when i did it ). Oh, and by the way, just to be clear; all of the above is just the Autocheck-part, I assume that you already have the BC (board computer) wired? 1) In the first picture , the oil pressure wire is clear to me, but where does the yellow connector and the two brown-ish connectors go? Why two? Will I have them in my car? What do they connect to? I sort of assumed that the yellow one connects to the yellow one from the second picture , but I'm not sure , as I'm not sure about the two brown ones too. 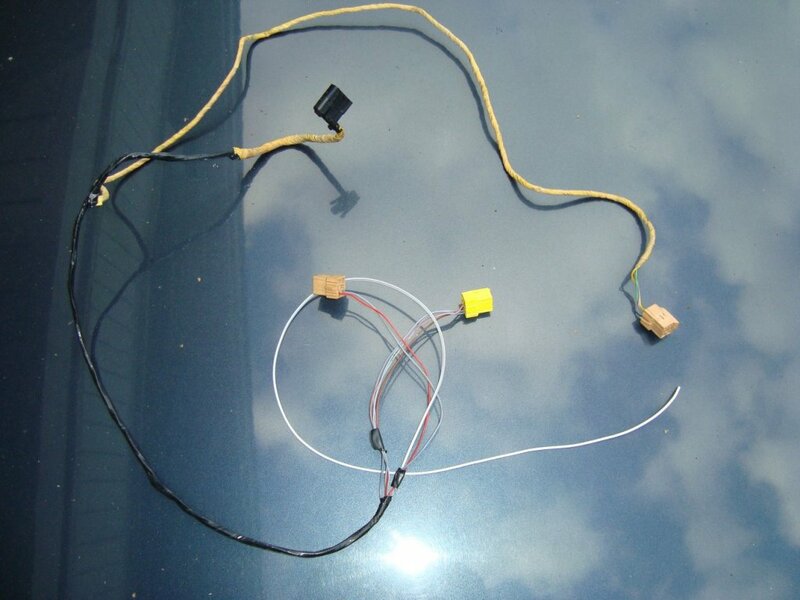 2) The yellow and yellow/black wires that go directly to the low beam lightbulbs (left/right) - do I actually have them in my wiring harness and will be able to connect them at whatever place I found them or are these some additional wires that I will have to bring all the way to the headlights? 3)The grey/red wire in the yellow plug that goes to the hydraulic brake pressure switch - I should have it already somewhere too? So should I just find it in my wiring loom and connect it anywhere?? 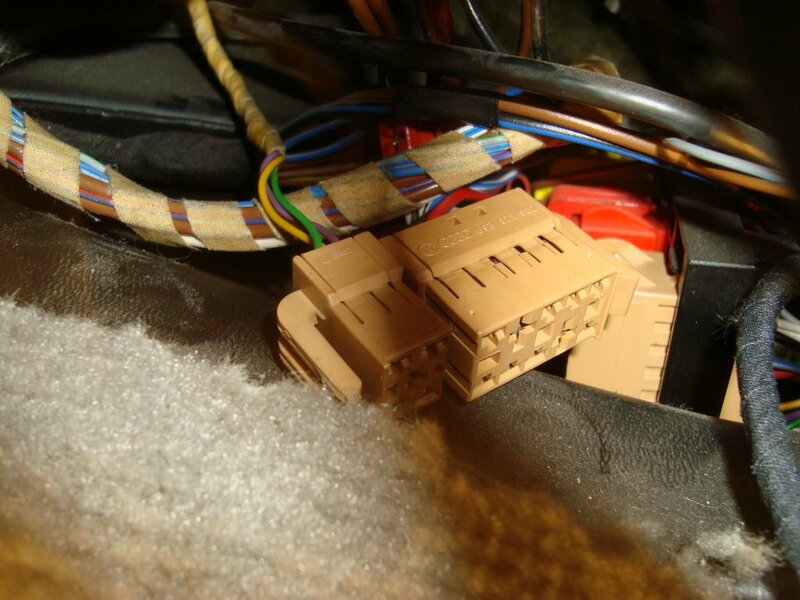 4)You wrote about taillight wiring: "In that strand, there are 3 thin wires which will not be found in the non-autocheck wiring harness, those are the red, the gray and the black/blue wire (red and grey can be seen coiled together in the bottom left of the picture) those can be followed to a plug in the front of the car if you don't want to cut them"
Let's say I follow them up all the way to some plug and disconnect it. Where will I be able to connect it in my car? Do I have that plug? Is that one of the connectors/plugs that belong to the AC wiring loom near the instrument cluster? (The brown plug maybe??) What about the black/blue wire? Where does it go , what does it connect to and where should I cut it at? 5) By saying "2 bulb warning units" you meant the 281 relay in the front AND as well that white thingy in the back , for the taillights? 6) I checked that taillight bulb holders for cars with Autocheck have "A" at the end of their factory number , so I will double check if they are the right ones. There is actually a chance that either one or both that I use now in my car are actually the right ones, because I've changed them in the past. 7) What about brake pad indication? And no , I don't have the BC properly wired, unfortunately. I have it wired to my handle though, but I have the KG computer and injection system and someone told me that KG never had A BC , so there is no way to actually "get" the information about fuel etc. , which I don't know if it's true , but basically my BC is not connected and doesn't really work , apart from showing time. The other brown plug as well as the yellow plug are placed in the holder which is located to the left of the auxiliary relay panel (this is sort of the ”wiring centre” of the car where a lot of things like lamps, sensors and so on are connected to the ”user interface” parts like instrument cluster, switches and so on). Ignas.quattro hat geschrieben: 2) The yellow and yellow/black wires that go directly to the low beam lightbulbs (left/right) - do I actually have them in my wiring harness and will be able to connect them at whatever place I found them or are these some additional wires that I will have to bring all the way to the headlights? Yes, on your car the yellow and yellow/black wires are already connected directly from the green plug in the fusebox to the headlights. Ignas.quattro hat geschrieben: 3)The grey/red wire in the yellow plug that goes to the hydraulic brake pressure switch - I should have it already somewhere too? So should I just find it in my wiring loom and connect it anywhere?? Well.. yes and no - it's true that you already have a connection to the pressure switch in your existing harness. BUT, it is connected in parallel with the level switches from the brake fluid reservoir and the hydraulic fluid reservoir. With the mini-check this is fine, because they all light the red ”brake warning” light in the dash - but you may have noticed that this light tends to flash even after the engine is started, if the car hasn't been driven for a long time - this is because the pressure reservoir (the bomb) has lost pressure, and this needs to be built back up before the pressure switch is ”switched off” again. In principle you could leave the harness wired like it is, and just leave the extra wire to the Autocheck hanging. BUT: The autocheck latches warnings for a period of time (i.e. even if a switch is grounded for only a second, the Autocheck will be lit with the appropriate warning for a period of time (can't remember how long, maybe a minute or so...)) and the warnings in the Autocheck are accompanied by a ”BEEP BEEP BEEP”. This means that in the event of the car not having been driven for long enough for the brake pressure reservoir to be without pressure, you would get at ”BEEP BEEP BEEP” and have to look at the brake warning for a minute, when starting the car, even though everything is working as it should. SO, long story long, to avoid this, the signal from the brake pressure switch is routed to a different channel in the Autocheck instrument, in which the instrument ”ignores” the channel for the first minute or so after starting, to avoid the ”BEEP BEEP BEEP” and so on... And you'll have to retrofit this separate wire to the pressure switch, if you want the Autocheck to function completely as factory. Ignas.quattro hat geschrieben: 4)You wrote about taillight wiring: "In that strand, there are 3 thin wires which will not be found in the non-autocheck wiring harness, those are the red, the gray and the black/blue wire (red and grey can be seen coiled together in the bottom left of the picture) those can be followed to a plug in the front of the car if you don't want to cut them"
Yes, as you already guessed, those will have to be connected to the existing brown plug in your car, which in turn will connect to the autocheck plug behind the instrument (this also goes for the black/blue wire, which can be untangled all the way to the front just like the grey and red, if you have the time ). Ignas.quattro hat geschrieben: 5) By saying "2 bulb warning units" you meant the 281 relay in the front AND as well that white thingy in the back , for the taillights? Ignas.quattro hat geschrieben: 6) I checked that taillight bulb holders for cars with Autocheck have "A" at the end of their factory number , so I will double check if they are the right ones. There is actually a chance that either one or both that I use now in my car are actually the right ones, because I've changed them in the past. Ignas.quattro hat geschrieben: 7) What about brake pad indication? Brake pad indication is a part of the existing wiring harness in your car (in either the black or brown plug in the back of you instrument cluster, seem to remember it's the brown..) – so that will work without adding any extra wires. Ignas.quattro hat geschrieben: And no , I don't have the BC properly wired, unfortunately. I have it wired to my handle though, but I have the KG computer and injection system and someone told me that KG never had A BC , so there is no way to actually "get" the information about fuel etc. , which I don't know if it's true , but basically my BC is not connected and doesn't really work , apart from showing time. Thank you very very much so far for the help provided!!! Before starting to connect everything , I have another problem that I need to solve which involves a constant oil warning flashing ever since my engine was swapped. So yesterday I removed the wiring with more wires than needed at places , because the whole harness was ruined anyway, so I could cut out more I took a complete taillight harness until the connection , but it has some modifications made to it that I can't understand. Maybe there was a non-factory towing hook installed or something. And it looks slightly different , but I think it's a matter of avant/sedan difference, hopefully. I haven't checked the wiring in my car yet to compare, so not easy to tell. P.S. I've got only one taillight bulb holder with "A" at the end of the code and yes , it's grey , not black. I have to check my garage , I'm sure during those years that I have owned this car at some point I had grey holders installed , but I have changed them to black ones in much better condition. I also removed some of the BC harness - but I still don't know what does it connect to and where does it go. I just had to cut all the wires at some point because I could not reach where they were going , but all of them were at one place. Do you know where do they go and connect to? Well you're welcome - and what a nice "loot" you have there! Your oil-pressure warning, does it only come on when engine RPM exceed approx. 2000? Because then it's probably related to (missing) wiring of the Autocheck-instrument. How the Board-computer is wired depends heavily on the engine-management of the given engine - for instance on (at least some) engines running KEIII-Jetronic and Motronic, all you need to do is run a single wire or two from the ECU to the BC instrument, and you're done (you also need the right code-plug of course). But on other engines you may have to run wiring to the idle control relay, the ignition module - as well as add a sensor in the fuel-distribution unit. And on other engines still, the BC was never an option. I don't have any schematics for the KG, so I don't know which "category" it falls under. cvj-dk hat geschrieben: Well you're welcome - and what a nice "loot" you have there! No, my oil-pressure warning is ALWAYS on. That is the problem. Always - so on ignition too. Takes a few seconds after I turn the key for the warning to start flashing and beeping. Finally I've started to connect the wires and I found some connection that I don't know and there is no information about it. And there was one more small difference. 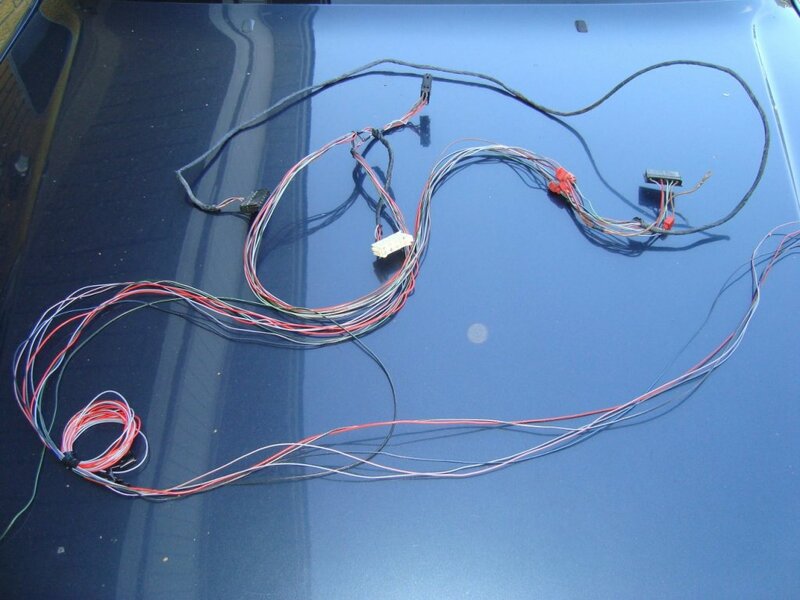 In the picture you can see on the LEFT - taillight wiring harness without autocheck , on the RIGHT WITH autocheck. 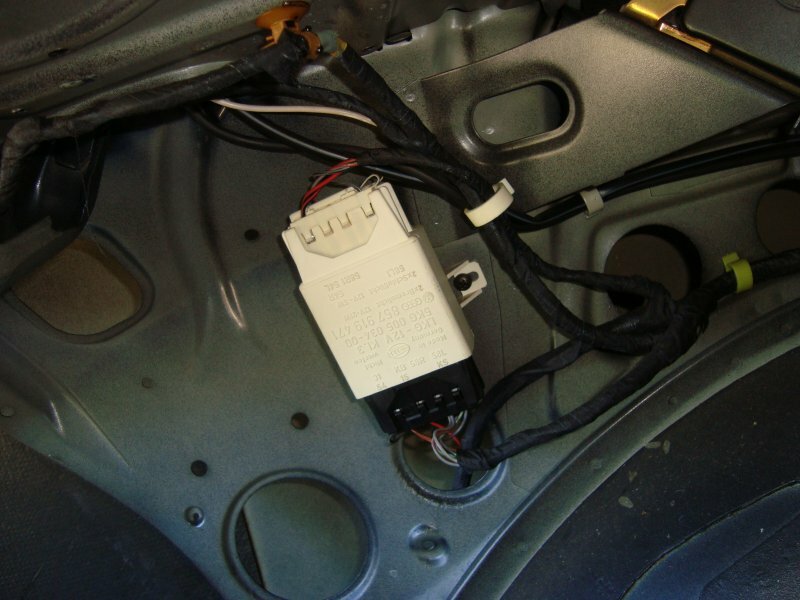 THEN: the remaining three wires that aren't in cars wiring harness that must be connected to the brown plug. It turns out that I already had the black/blue wire in the brown plug. Just had to connect the red and grey wires. But then there are more wires that came with that part of autocheck wiring(where those red and grey wires came from). Two of those remaining wires end up in some black two pin connector. I think it was black/blue + red/green that came from somewhere else (can't remember, but will check it out tomorrow). Looks like I've connected everything (except for the additional plug on the taillight harness, which I don't think is necessary, because for some reason it stays exactly at the drivers seat area) , and I still have to connect brake pressure wire and washer fluid level wire. 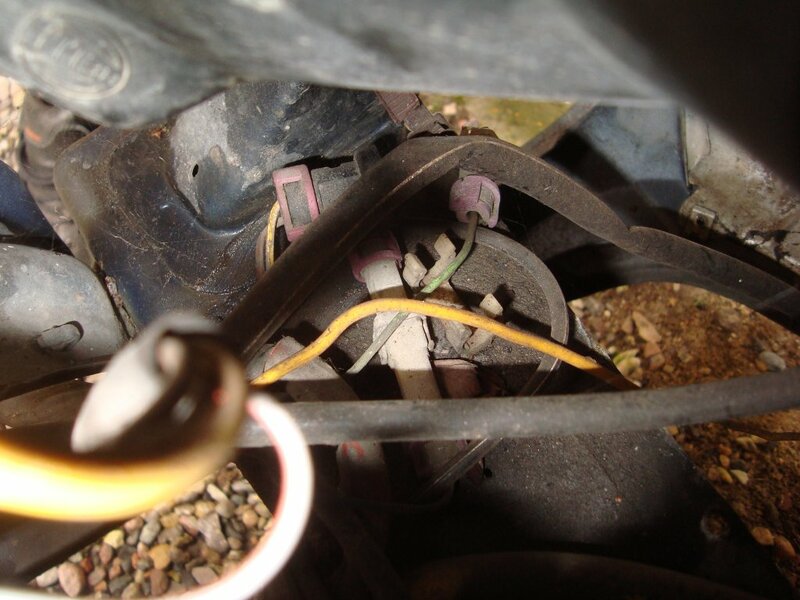 Which , by the way , I've read could be connected via some GREEN wire , which I indeed found in the yellow plug in my cars harness(as you wrote in your site) , but I have no idea where it's located in the engine compartment. I would love NOT to route any new wires through the engine compartment and use the existing ones , which are not used in my car. A little help on where could this be located? 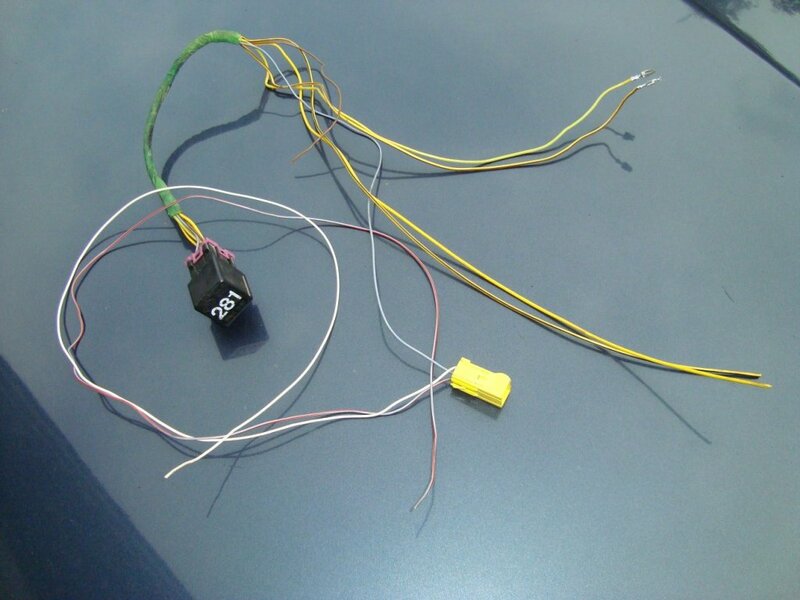 And then , since I disconnected this one pin blue connector(from taillight harness, blue/yellow wire) yesterday , overnight I forgot where it was taken out from, damn it, such an idiot. I connected it to where I THINK It was supposed to be connected from the way I remember that it was very uncomfortable to remove from behind the yellow connectors. Now, is this placement in the picture correct?? By the way , the brown plug for the taillight harness - I just needed to insert TWO wires in the plug - grey and red(which go to autocheck plug, right?). Blue/black was already in the car, but now in the picture below I see that you had it already too. Maybe I mixed it with the wires that come from the taillight harness? I took it out along with the whole plug, so I've just installed the whole brown plug. I've also found out that the previous owner of the taillight harness had made additional connections for god knows what before the taillight checking unit(the white box). Since I will install the additional 5w lights where the fog lights are (US rear light composition), I will probably use those wires. OR , since the taillight checking unit only checks the difference (right?) I could wire those lights somewhere after the unit and I will also have those to be checked everytime. Do I understand it correctly? The one with the female connectors is the one which already has a black/blue and a blue/red wire, the black/blue is what supplies 12V from the car, to the rear sending unit. In that plug, you only have to install the red and grey wires from the plug which goes directly to the Autocheck instrument. And because you've taken the complete rear harness from your donor (if I'm right from looking at your pictures) the three male connectors from the red, grey and black/blue are already connected, so you should be good to go there. P.S. Autocheck and boardcomputer were dead because of this(picture below). Re-soldered it - works like a charm! 2008 - 2010 - 2012 - 2015.
this is just AWESOME, all the hard work leads to a real beautiful car. I still have problems with oil pressure warning flashing all the time... I really don't know where to go. Both sensors , If I remember correctly , work just as they should. It is happening with two different instrument clusters. So could it be the wiring? But if the wires are switched between sensors , the cluster reacts. One way the warning is flashing always , the other way this warning is flashing when the pressure drops below , I guess 1.8bar upon idle with warm engine. The pressure itself it the engine , I haven't measured it now , but it was good. When it was measured , the problem of constantly flashing warning light was already there.